Improve and streamline communication with Upserve Logbook. Make it painless to get the straight answers you need to run the smoothest shifts. Handwritten notes can be hard to read—and that’s assuming you can even find them amidst the mess in the kitchen! Save yourself from searching and squinting with our restaurant logbook tool. You can use a restaurant logbook for so many different things—the most important having to do with communication between staff and management. Take a look at how our customers are making the most out of Logbook. For managers in charge of multi-location restaurants, it’s hard, but necessary to establish regular communication with your people on the front lines at each location. Using our restaurant manager logbook template, it’s easy to create opportunities to interface with staff outside of once-weekly meetings. Get instant clarity on last night’s numbers while inquiring about specifics with regards to sales, covers, or notable guests. Once you settle into the groove, you may even find that weekly in-person meetings are no longer necessary. Create more time in the day for revenue-generating activities! Over 80% of restaurants are turning to technology to run their businesses more effectively. 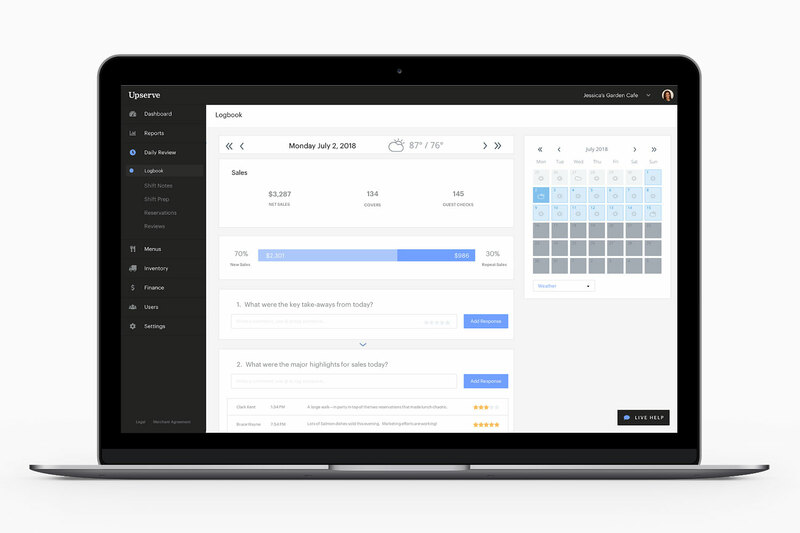 Think of Logbook as the context behind the data—straight from your servers’ mouths! Though your menu might say “no substitutions”, we can assure you that our restaurant logbook technology is completely customizable to handle all of the unique nuances of your business. Create custom questions and checklists for staff to complete while closing down for the night. If you have a different process for weekdays and weekends, Upserve’s Logbook can accommodate! 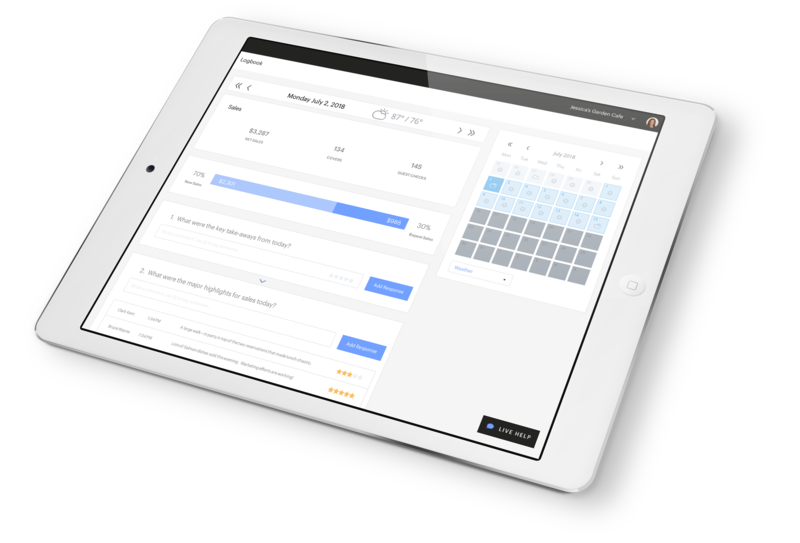 If you ever need to change your restaurant manager logbook template, it’s something that you can edit in minutes—even from your smartphone! The idea of having “everything in its place” is just as important when it comes to the business side of your restaurant as it is in the kitchen. We’ve created the perfect restaurant manager logbook template that is as easy for employees to use as it is fun. The right restaurant logbook structure encourages people to actually make use of it—improving communication between team members. With a digital logbook, now you and your managers can provide feedback on every shift. Using checklists and customizable questions, you can get the management team on the same page and share knowledge across the board. Without guidance, your staff may think it’s ok to leave a series of handwritten notes, texts, or emails to share feedback from their shifts. The problem with this approach lies in the fact that there’s no centralized spot that all relevant team members have access to. As soon as you delete that email or throw out a note, the insight it contains is out of sight and out of mind—forever. Bottom line: written notes, emails, texts can be inconsistent and hard to manage. 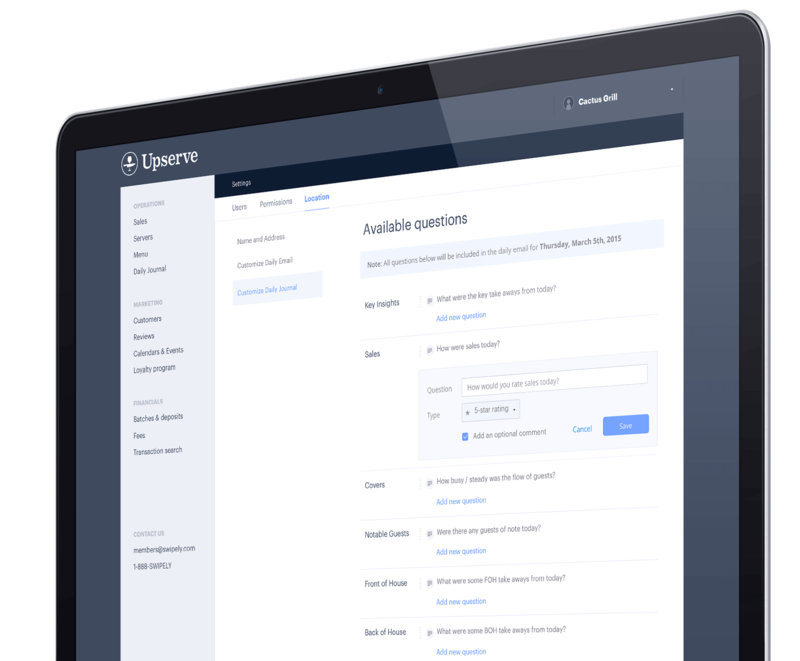 Upserve’s Logbook makes the feedback process streamlined – managers can even provide answers to questions right through the Upserve Live app, while you have one place to review and look back on previous comments. Upserve Live puts all the things you love about restaurant management tool Upserve in your pocket. With smartphone apps available for iOS and Android, you’re always in the know.